A segment in which we go back and revisit archived content from the previous BAIA network. In this episode, we travel to 2014 - and tour avid art collector Fearn Galloway's home, and talk with her and her nephew Major about their impressive, well established art collection. Major, how did you develop your interest in art to embark on building a collection? [audio mp3="http://blackartinamerica.com/wp-content/uploads/2018/05/Major.mp3"][/audio] From childhood, I recall three prints my mother displayed to decorate our modest home: two European landscapes; a Parisian street, an image of a European church; and the Three Musicians by Pablo Picasso. But I know that I was most influenced early on as a child seeing the personal collection of my Aunt. I remember seeing these elongated brown figures by Ernie Barnes and this bluish green Baptismal scene by Romare Bearden. [gallery columns="2" ids="2844,2845"] Later as a young adult I would learn many of these images I had seen and had an appreciation for since early childhood in the 1970’s were created by African-American artists who are considered as masters of the 20th century master. As a child of the seventies, we enjoyed “Good Times” before the Cosby’s and I was captivated by the images shown in some of the episodes produced by the character “J.J”, the painter who lived in the Chicago public housing project in the “ghetto”. 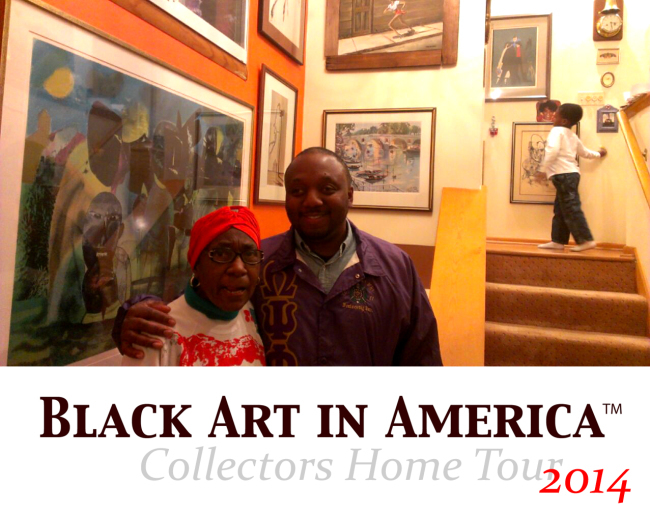 Here my aunt shared that a few of the original paintings in her home were by the real artist, Ernie Barnes. 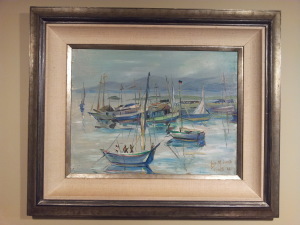 I beamed with pride knowing my aunt had a collection that included a famous artist whose paintings were on television. As a child, this made me even more proud of her and our family. I was already proud because I know she was a mathematician and my uncle was a chemist whose research made 37 different discoveries in the field of chemistry. Later in middle school, then college at Grambling State University and as an adult my interest began to grow as I learned about the European and American Impressionists, the figurative paintings of Picasso and more African-American classical and emerging artists. As an adult, I began to desire to purchase art to decorate my first home in the Brookland neighborhood of Washington, DC and even more after we built our current home here in Upper Marlboro, MD where I have more space and have been blessed to divert some disposable income to make some acquisitions. Barnes captured these images that on one-hand showed poverty, but they were beautiful as they captured a boy playing basketball alone, children playing simple games; people singing and dancing; despite the clear images that showed the people living in poverty. The people were depicted in abject poverty or tough situations, but they still were having fun and found enjoyment in what they were doing. That’s the message I saw most in Barnes’ works I saw on t.v. and in my aunt’s home. And this kind of mirrors the plot and story line in all of those classic episodes of “Good Times”. Ms. Fearn: “In the early 1970’s I recall walking up three flights of steps in this NYC city building to the apartment and studio of Romare Bearden. I don’t recall if there was an elevator, but the steps were narrow. And then inside of the apartment, splendid works were everywhere. It was just amazing”. My aunt has told me some great stories about how she grew her collection. 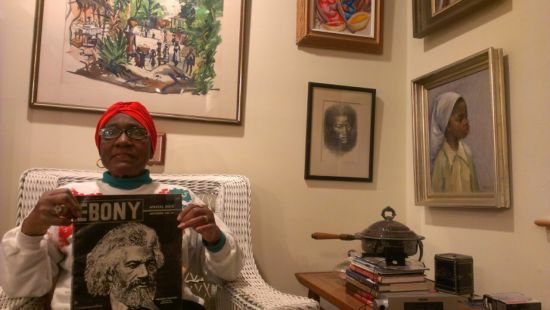 Some of the best are of her visit to the upstairs third story of Romare Bearden in NYC and her conversations with Lois Mailou Jones who she lived nearby in the late 1960s and early 1970s in northwest Washington, DC. As you know, Ms. Jones was the Director of Painting and Water colors at Howard University’s art department for many years. My aunt recalls that Ms. Jones was very friendly and a “person of her word” and my aunt really appreciated this. She purchased this piece for $250 and Ms. Jones allowed her to buy it after an initial down payment of $150. 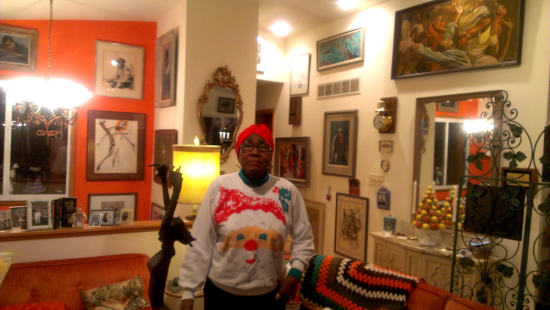 Before the final purchase, Dr. David Driskell came by Mrs. Jone’s house and expressed his desire to purchase the piece for $500, double the asking price Ms. Jones required of my aunt. My aunt recalled Ms. Jones told my aunt what Driskell had said to her, “Mailou, you are giving your art away”. My aunt says Ms. Jones wanted to get her art in the hands of African-Americans and interested persons. My aunt was very thankful that Mrs. Jones honored her promise and initial agreement and this in the eyes of my aunt spoke volumes about the character of Ms. Jones which I think comes across in a very real and personal way, like the painting “Jennie” who was the student of Ms. Jones who was cleaning fish in her home. She was personal and took special time with her students in a personal way, even outside of the normal academic setting. 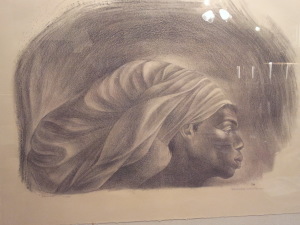 My aunt told how she purchased this portrait drawing Mailou Jones had sketched of an elderly African-American man. The piece demonstrates the versatility of Ms. Jones who is mostly known for her impressionistic painting, but she was also a book illustrator. Ms. Jones was known for her landscape and street scenes in Paris, Martha’s Vineyard and in Haiti and the Carribbean. My aunt told of how Ms. Jones said early in her career critics said she did not paint enough images of black cultural images or themes. After hearing this, my aunt says, Ms. Jones told her she went out and found the first person she could find who was an African-American and she sketched a portrait drawing of this man. This was a wow moment for me because my aunt’s story mirrored what I had read in the book, “To Conserve a Legacy”, that Jones had been criticized for not doing enough works on black subjects. And the book told how from 1939 to 1945 Jones began creating work that focused on the black experience. Alaine Locke, the father of the Harlem Renaissance and first black Rhodes scholar and Howard University professor had admonished Jones to do more works on black subjects. Major, What type of art do you like and what has inspired and driven your passion to collect art? From a big picture perspective, my aunt’s collection is my model because she was “ahead of the curve so to speak”. However, I glean insight from art books, artists like yourself, dealers and collectors that I interact with. I strongly believe there is a huge demand for the medium and types of communications forums that Black Art in America is providing and building. First, I buy what I like as a consumer. I also buy what and when I can afford to do so. From a purely artistic stand point, I am inspired by both images of beauty I see and the ideas behind why artists use their gifts to create what they do. What is the message behind the piece? What is the artist trying to say? How does the piece personally speak or resonate with me? Personally, I like art based on the beauty I see, and on the intellectual side, what the art make me think for feel. I collect what I like because our artists have produced works that tell our story in a very beautiful, powerful or poetic way. I purchase things I think reflect me and what I want to project. I like images of black people with our varying hues that show beauty. I also like images that communicate and tell our story of challenge and triumph; from whence we have come because I am inspired by the progress and strides that have been made. I also like the art that reminds us of where we need to go as individuals and as a collective group. I like images that affirm us and show family and children, love and passion, our men loving and respecting women who look like them and women loving and appreciating men who look like themselves. That was the story of my family and I like artists that inspire and affirm this reality for me. I like colorful abstract and figurative pieces that entertain, are festive and illustrate music and spiritual concepts and images with rich colors are very appealing to me. I think that is fed by some of my fondness of the rich colors of the European Impressionists like Van Gogh, Gaugin and Monet. I liked them when I saw the images in middle and high school and when I visited Musee Dorsay in Paris, and the world-famous NY gallery at Central Park West. I am really fond of collages and mixed-media period pieces with rich and vibrant colors and powerful messages that you produce that depict southern and traditional black culture. My plan is to secure some classical pieces when it is feasible, but more abstracts, landscapes with rich colors and collages by emerging artists that are establish themselves and will possibly be prominent masters with troth's of treasures in the years to come. This acquisition plan includes one or two more sculptures. An original by Thomas Lockhart entitled “Drums on the Bayou with New Orleans and Lake Ponchatrain and the Mississippi river as a backdrop. It is special since I went to college at Grambling State University and pre-Katrina I enjoyed the Bayou Classic and Mardi Gras. A serigraph by James Denmark entitled “When Love Was Young”. This piece is exquisitely beautiful and depicts a couple with dark hues who are engaged in a warm embrace while reclining on a sofa and gazing into each other’s eyes. “Rejoicing,” is an original collage by Najee Dorsey. It depicts a worship scene in a church. This powerful piece is rich and vibrant and inspirational as it captures the energy and power of a spirit-filled black church that could be anywhere in America or the world. It resonates with me as a tribute to my mother who taught her family and as an example to worship and to love God. She was a virtuous and godly woman who helped people. She has made her transition, as a metaphor her image is dropped into the piece. It illustrates she is still very present within us and as her spirit, bloodline and legacy lives on. That’s what this piece entitled “Rejoicing” means to me. “Send-Off” by Ann Barbieri. An vibrant and colorful original abstract, entitled “Send Off” by Ann Barbieri who showcases her pieces at the Torpedo Factory in Alexandria, Virginia. She is an artist with an established presence. I simply love her work and the rich and vibrant colors that blends and mixes and splashes on canvas and paper and mixed-medium pieces in an amazing fashion. Great Artists from One Generation to the Next Connect Us with the Past and Our Future. My aunt has a 1963 Ebony article with Frederick Douglas, the abolitionist on the cover. This 1963 printing coincides with the 1963 March on Washington, another key point on the time-line in our nation’s march toward full liberation and civil rights of Black America. My aunt used these publications to do some of her home work to learn of both prominent and emerging black artists. Today, all of these artists are considered to be our 20th and 21stcentury masters. The cover of a 1963 Ebony article shows an image of Frederick Douglas just before the 100th anniversary of the end of slavery. Then there is an drawing by Charles White showing what looks like a youthful Frederick Douglas. Then there is the linoleum cut that you produced, entitled “Field Worker” that reminds me of these images of Frederick Douglas. So, these images in a publication, the work of a classical master, connected with your work inspire me and I see a link between the two images from Frederick Douglas, to Charles White (a master) to the Najee Dorsey image of “Field Worker”. What are the barriers to art collecting and interest in black artists? Collectors with disposable income and interest by the larger public and community of collectors. There is and has been an going challenge and opportunity centered around exposure of art and the artists that are out there and how their works and images and message about their art is communicated. I have always had a passion for art and it has grown as I have worked my way up the income ladder and have more disposable income to make purchases. Initially, I had to overcome the price of certain works. I remember a work that cost $400 in the mid nineties when I first began working after graduate school. This seemed like a lot of money. I didn't make an initial investment then at a Jazz festival in Annapolis, Maryland, but now that $400 doesn't seem like so much to spend on a piece. So, the message is to “follow the money and there you will find aspiring collectors and new markets as they become more aware of emerging artists and the art that is out there. Exposure of our artists and public education are very important to grow demand and our national interest in art and that of African-American artists. Outreach by the Print Media. Ebony magazine used to advertise in support of black artists. I am not sure that continues to be the case today. They also have had a prominent collection on display that my aunt visited on more than one occasion. I think there is a great potential for Black Art in America to fulfill this media void in today’s technology age of twitter, i-phone, i-pad and on-line communications era. How do you think that art will influence your son Gavin? 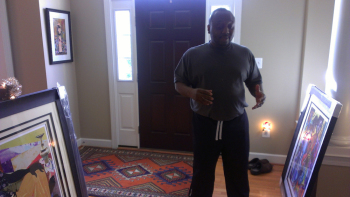 As a parent and father you want to nurture, love, and provide guidance to help grow your child. You want them to love and to be all that they can be. You want to help them grow spiritually and emotionally. I hope he will find affirmation and be positively influenced by the art and images that he sees in our home. I hope the art Gavin sees will help him see the beauty and gifts within himself and the people that look like him. I hope he sees men and women that look like him that love each other. I hope he sees the positive images of family and people that care about one another. I hope he will recognize he is a part of a “family” and a rich story that is part of the fabric of America. Hopefully, my son will follow our example and have an appreciation for the art in his home as we treasure the images. Art Is Treasure: A Legacy-Investing in Our Future.